Sold out, with a waiting list to boot. Over fifty walkers had signed up for what would surely be a glorious mid-August walk with a fortnight to go. Suntan lotion at the ready and I’d even considered the possibility of lumping some disposable family BBQs up Jacob’s Ladder. Oh yes, this would be a summer scorcher. Then John Kettley and his chums started to have an opposite say. Hmmm. Now I’m always optimistic when it comes to weather but 72 hours before last Friday’s walk, it wasn’t looking good. Even found myself researching lightning avoidance strategies instead of suitable meat marinades. What had I become? With no relenting in forecast I offered the easy way out for those concerned by the potential of all-day torrential rain and poor visibility. 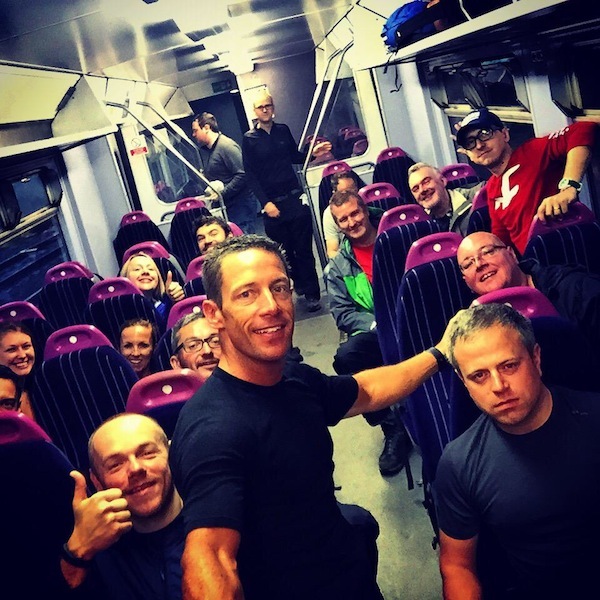 An e-mail very quickly flushed out many wobblers and come Friday morning, 24 hardy souls gathered to take the train to Edale from Manchester. 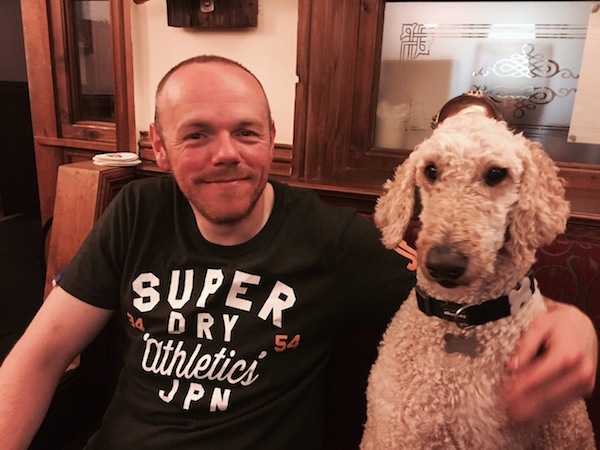 It was the first time we had started a walk outside of Glossop, with the intention of hiking back to our spiritual home at The Wheatsheaf, via the mighty Kinder Scout. Mightier today, I suspected, than usual. But before the train, the beating sound of rain on the Manchester Piccadilly station roof was like a giant “you guys are actually crazy” klaxon. 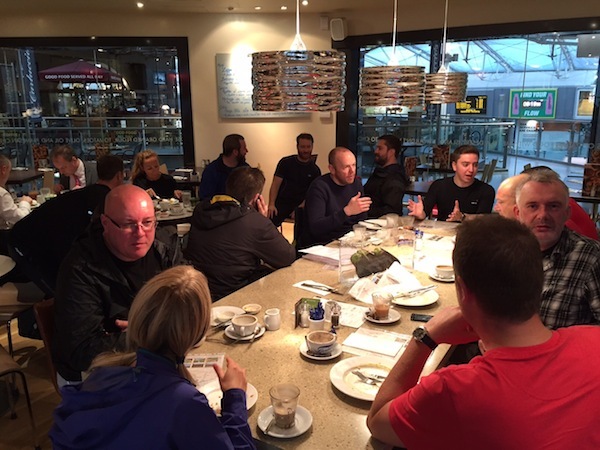 If anyone had feared the conditions ahead, they did a great job of hiding it, as spirits were high and a steely determination had engulfed the group over breakfast at Carluccio’s. 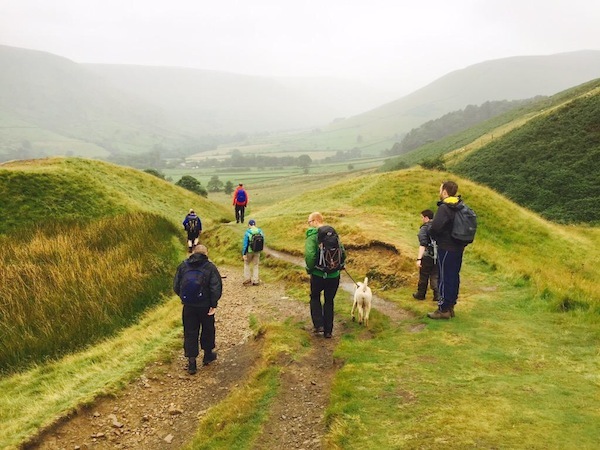 The initial walk out of Edale village was gentle enough as we picked up the official start of the Pennine Way and hiked through undulating terrain with ghostly views of both Mam Tor to our left and the Kinder plateau to our right. 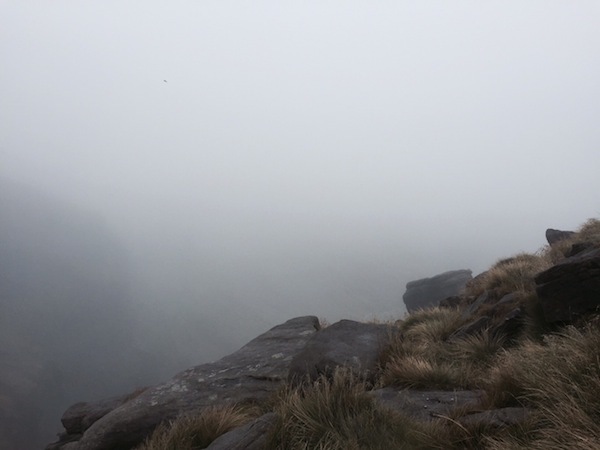 The initial target of Jacob’s Ladder was a mile or two ahead of us and shrouded in hill fog. The excitement of the unknown was tangible. There were plenty of Freshwalks debutants within the group and many of these right up with the frantic pace being set. Chris Fargher (Gekko), Andrew Ramwell (Know and Do) and John Shinnick (Desap) all embracing the early slopes and getting stuck into the terrain. As we hit Jacob’s Ladder (the main ascent of the day), the rain seemingly went through the gears and lashed into us even more, just as legs and lungs started to feel the heat. It was a gruesome test that stretched the group out but what a sensational feeling when the worst of it had been seen off. From the top, we curved round to take some temporary shelter under Edale Rocks and allow things to regroup before a short trek to the summit of the day, Kinder Low (at 633m, very nearly the highest point of the Peak District). Thankfully, we benefitted from a relative reprieve for about 30 minutes around lunchtime as the severity of the rainfall subsided allowing sandwiches to be munched fairly soggy-free at Kinder Downfall. One disappointing feature was that the poor visibility denied us the usual stunning views from the top but the alternative ‘vision of nothingness’ also had some merits. 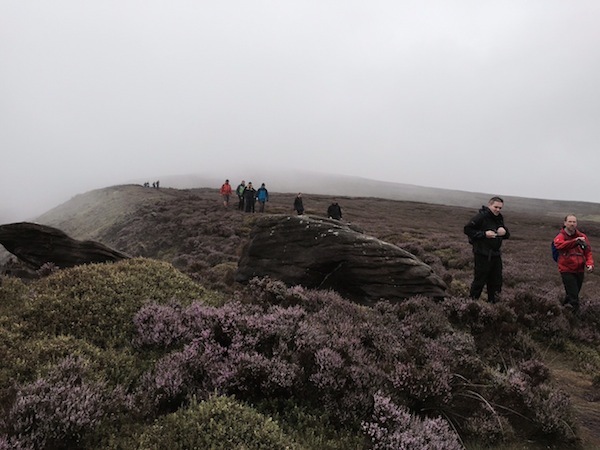 As we headed back along the west side of the Kinder Plateau, away from the waterfall, all of a sudden, a serious spot of hill fog drifted in and walkers were now losing sight of each other front and back. There was definitely a magic about the sheer drop view to the left. “Ay, it looks like Lord of the Rings over there” quipped Sam Jones (Tunafish Media). Probably worth mentioning, in case you were wondering, that the rain was still lashing down and by now, the waterproof credentials of recently bought garments were being ridiculed by mother nature. Squelch, squelch, squelch. We had a slight problem with a small group of five who had dropped back to accompany one hobbling walker. Given the weather it was impossible to keep the whole thing together as we started the rapid descent off the plateau past Mill Hill up onto Harry Hut. Within an hour we were down on Derbyshire Level and the weather finally subsided to allow us some respite as we rounded Glossop to reach the Wheatsheaf a little ahead of schedule. We’d made good time all day without the usual leisurely sunbathing breaks and together with Gary and Lisa Chaplin, I’d forced a decent pace over the final few miles, keeping cold limbs as warm as possible. And the pub. Finally, the pub. It’s usually a welcome sight at any time but a dry pair of socks and shorts and a pint of anything wet had become this particular group’s Holy Grail. As with most of our walks, a small platoon of hardy hill-walkers stuck around most of the evening to celebrate no small achievement in completing our chosen route, given the harsh conditions. As Matt Walmsley (BOC) had said the evening before: “If you’re going through hell, just keep on going.” Think someone else said it first, mind. We’re walking again on Friday 18 September. There are still tickets left here and please email Michael Di Paola on Michael@freshwalks.co.uk if you are interested in a slightly easier walk in October. Details to be confirmed but looking at a route roughly 5-6 miles long over half a day.